Unlike traditional typical windows, which allows both heat and cold to seep in during extreme weather, insulated windows can protect against such unpleasant weather. Typically, windows are the worst way to be energy efficient in the home, and those single-pane windows were the most appalling of the sort. Currently, the standard is insulated windows. They are not only energy efficient, but they also retain heat, which keeps families warm and cozy during the winter. These insulated windows are a huge improvement over a single pane, as they are better at regulating temperature, which maintains the internal temperature of the home at a very comfortable state. Another form of insulated windows is solid wood windows. They also protect against heat and cold; however, they can be costly, and do require maintenance. In addition, they may swell and contract. There is now a new type of window that is like extra high-efficiency products that have been gaining in popularity. They are now twice as efficient as double-pane windows. That means double the likelihood of the warmth staying within the home during the winter, and the cold staying out, and a cozier Christmas for the family. Imagine not having to run your heater as much during the winter time. Your skin would not be as dry and your lips would not get as cracked from the dry heated air. 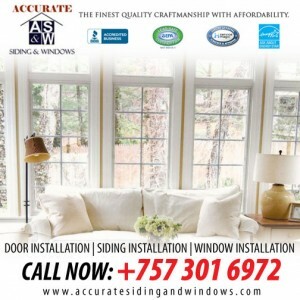 At Accurate Siding and Windows we specialize in insulated windows. We are the leader in window installation service. Out of all window installation companies, we offer the best window installation service. Our Virginia Beach contractors will help choose the best windows for your need. A good window installer can be a big difference in how much money you save in your heating and cooling bill every month.